Based on Steve Neu’s awesome 15 series motors, these are works of mechanical art. 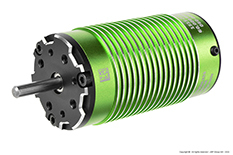 They feature high quality oversized bearings, sintered Neodymium magnets, superior electromagnetic design, and rigorous engineering control in our own factory resulting in a Monster motor we can put our name on. Neu-Castle 1512 1Y 2650kv motor is great for 4s buggies. 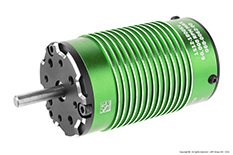 Neu-Castle 1515 1Y 2200kv motor - is made for up to 6s Monster trucks. The efficiency of a motor determines its quality. Higher efficiency means better design and high quality components. The higher the efficiency of the motor the more power it can produce before it overheats. Here’s a little math, we promise it won’t hurt. Say you are laying down 1,000 watts, (about 1 ¼ horsepower), and your motor is 70% efficient. That means you are turning 300 watts into heat. Ever grab a 300 watt light bulb? If the motor is 85% efficient it only burns 150 watts as heat. More power goes to the wheels and the motor runs cooler and able to put out even more power when needed. Mamba Monster systems typically pull 4,000-5,000 watts (5 to 6 horsepower) under acceleration. These motors are some of the highest efficiency motors that we have ever tested; they are up to 85%+ efficient on our test rig. The more common Asian motors tend to show in the mid to high 70’s. At those power levels, one single point equals about 50 watts of heat! You know that soldering iron on your workbench? It’s maxed out at 50 watts. That’s a lot of heat; now consider wasting several times that much heat inside your vehicle. These motors can therefore put out significantly more power for longer periods than less efficient motors. Go ahead, run the motor you have on the shelf, we have a feeling you will find its heat limits quickly. Get even more out of your Neu-Castle 15 series motor with the CC Blower fan shroud!